Background Early identification and treatment of cardiovascular risk factors (CVRFs) is essential to prevent excess morbidity, mortality and healthcare-related costs. We sought to investigate whether an active screening programme at pharmacies could identify a significant proportion of patients with previously undetected CVRFs. Methods and results Between April and July 2013, 184 pharmacies in Lower Austria enrolled a total of 6800 participants, in whom body mass index (BMI), blood pressure (BP), total cholesterol and blood glucose were measured. Mean age was 58±17 years and 67.8% were women. 21% of men and 16% of women had a BMI≥30 kg/m2. The crude prevalence of diabetes mellitus (DM) was 7%, hypercholesterolaemia was identified in 57%, and 44% had elevated BP. Among fasting individuals (n=1814), DM was found in 18%. In total, 30% were confronted with a CVRF they were previously unaware of, and pharmacists recommended 45% of all participants to actively consult a physician. A first-time diagnosis of a CVRF was most frequent in the age groups between 25 and 64 (32% of participants). Conclusions This pharmacy-based approach for cardiovascular risk screening found similar overall prevalences of CVRFs as reported by national surveys, but revealed underdiagnoses, particularly in lower age groups. A previously unknown CVRF was identified in every third individual, frequently prompting the pharmacists to recommend the consultation of a physician. An active screening approach at pharmacies might therefore serve as an effective alternative to the public preventive medical examination, particularly in younger age groups. Screening programmes for cardiovascular risk factors are poorly implemented into primary care, subsequently leading to a preventable excess in morbidity and mortality. Previous small studies not covering all major risk factors could show that pharmacies are feasible sites for screening. The present study is one of the largest covering all major cardiovascular risk factors by instrument-based tests. One of the three participants was confronted with a major cardiovascular risk factor they were previously unaware of. The feasibility of this pharmacy-based approach is also underlined by a large sample that could be included in a short period of time. A pharmacy-based screening approach might serve as an effective alternative to a public preventive medical examination in primary care, especially in younger age groups. Implementation into a national disease management programme would be required to achieve a population-based impact. The well established and potentially modifiable risk factors for cardiovascular (CV) morbidity hypertension (HTN), dyslipidaemia, diabetes mellitus (DM), obesity, improper diet and lack of regular physical activity account for 90% of population-attributable risk for both, stroke1 and myocardial infarction.2 In other words, a dramatic 90% reduction of these events would be observed if the population were entirely unexposed to the mentioned risk factors. Accordingly, we sought to investigate whether a standardised, active screening programme for CV risk factors (CVRFs) at pharmacies could identify a significant amount of previously unknown CVRFs. This cross-sectional study enrolled individuals who visited a participating pharmacy in Lower Austria between April and July 2013. The Pharmacists College of Lower Austria, a province with a population of 1.6 million, invited all members (239 pharmacies) to participate. There were no age-related or other inclusion/exclusion criteria prespecified. All participants provided informed consent, and only anonymised data were collected. In individuals below the age of 18, parental or guardian permission was obtained additionally. All participating centres underwent investigator training where the study protocol, data collection as well as proper blood pressure (BP), glucose and cholesterol measurement were reviewed. Using a standardised questionnaire, the following variables were assessed: age, gender, height, weight, waist circumference, fasting at the time of survey (8 hours without intake of food or liquids, except for water), tobacco use, seated BP, total cholesterol and capillary blood glucose. Individuals were surveyed whether a new CVRF was identified previously unknown to the participant (including conditions requiring an instrument-based test, thus, impaired fasting glucose (IFG), diabetes, elevated BP or hypercholesterolaemia; not including smoking and obesity). It was at the discretion of pharmacists to recommend the respective participant to actively consult a physician based on the detected CVRFs, and this decision was recorded in the survey. In accordance with the 2003 European Society of Hypertension (ESH)/European Society of Cardiology (ESC) Guidelines for the management of arterial HTN pharmacists were instructed to allow participants to sit for 3–5 min before beginning BP measurements and to take repeated measurements in case of inconsistent values.7 All pharmacists were experienced in the measurement of BP. An oscillometric semiautomatic sphygmomanometer was used at all sites (Boso Medicus, Jungingen, Germany or Hartmann Tensoval, Wiener Neudorf, Austria). Total cholesterol and capillary blood glucose were measured locally using point of care devices (Accuntrend plus and Accu Chek Performa, Roche Diagnostics, Austria). Waist circumference was measured midway between the uppermost border of the iliac crest and the lower border of the costal margin, obtaining the greatest possible circumference in expiration. Discrete characteristics are expressed as frequency counts and percentages, and differences between groups were determined by the χ2 test. Continuous, normally distributed variables were expressed as means with SDs, unless otherwise specified. Differences were examined using the Student’s t-test or the Mann-Whitney test, where appropriate. Correlations were reported as Spearman’s coefficient. The level of significance used for all tests was a two-sided p value of 0.05. The Software Package for Social Sciences V.22 (SPSS, Chicago, Illinois) was used for all statistical calculations. Abdominal obesity was reported in the presence of a waist circumference ≥100 cm for men and ≥90 cm for women. From 239 pharmacies in Lower Austria, 184 (77%) participated in the recruitment of patients. In total, 6800 patients were included between April and July 2013, reflecting a recruitment of 36.9±43.5 patients per site. The mean age was 58±17 years, 67.8% were women. Twenty-two per cent of participants were below 45 years of age. The mean BP was 134±21/81±12 mm Hg, mean capillary glucose 112±29 mg/dL (not account for fasting status), and mean total cholesterol was 210±43, respectively (table 1). As presented in table 2, 48% of women and 66% of men were overweight (body mass index (BMI) ≥25 kg/m2) or obese (BMI≥30 kg/m2). For both genders, the correlation between BMI and waist circumference was significant (rs=0.79, p<0.01 for women, rs=0.76, p<0.01 for men). By use of the aforementioned cut-off values, the prevalence of abdominal obesity was similar between the genders (49.3% vs 49.5%, p=0.89, waist circumference women 89.9±13.8, men 99.4±12.7). Fasting and non-fasting participants were similar regarding age (57.3±17.2 vs 58.2±17.4, p=0.06), gender (p=0.29), BMI (p=0.49), waist circumference (p=0.17 for men, p=0.59 for women), total cholesterol (p=0.13), and DBP (p=0.41), but not SBP (136.9±22.3 vs 133.6±20.4, p<0.01). Mean capillary glucose was 114.4±30.1 vs 103.7±22.1 mg/dL in non-fasting and fasting participants, respectively. Considering only fasting individuals (n=1814), IFG and manifest DM were found in 28% and 18% of participants, respectively. As indicated in figure 1, there was a stepwise increase in the prevalence of DM with each age group, reaching 22% for fasting participants aged 65 and above (p for trend <0.01). 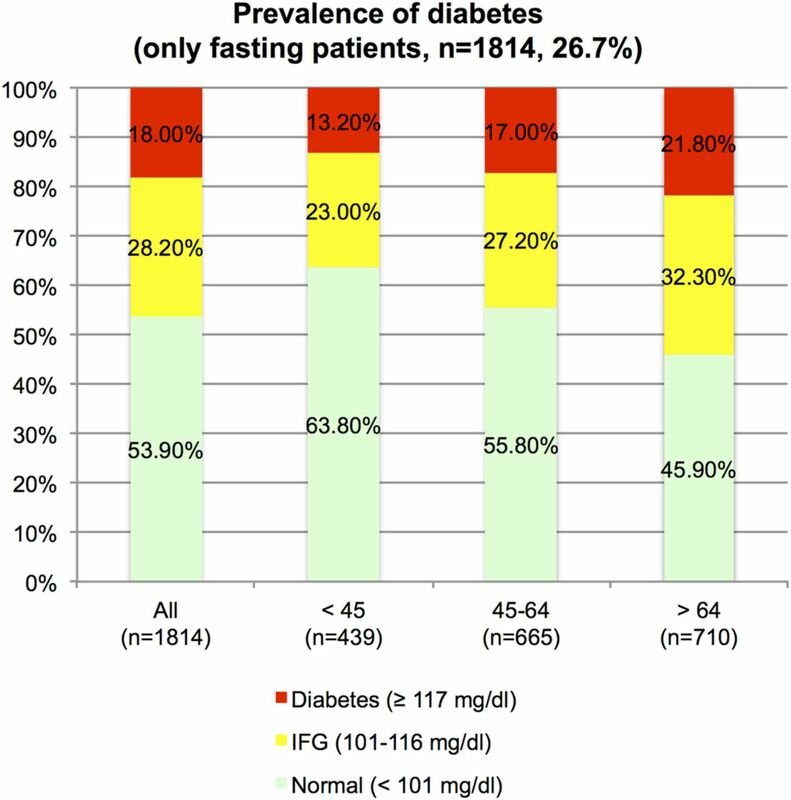 The prevalence of impaired fasting glucose (IFG) and diabetes mellitus in fasting participants (capillary glucose values). When taking the full cohort in to account, manifest DM (capillary glucose ≥200 mg/dL (11.1 mmol/L) in non-fasting participants) was observed in 6–8% of individuals (table 3). Elevated BP was infrequent below the age of 25, and absolute BP values were only modestly increased in individuals exceeding the BP threshold in this age group (144±19/87±12 mm Hg, figure 2). Thereafter we observed a steep increase in the prevalence of uncontrolled HTN, affecting every second patient ≥45 years of age. In these uncontrolled patients, mean BP values were 153±16/89±12. Two-thirds remained in HTN grade 1, that is, below 160/100 mm Hg. The increase in pulse pressure, that is, decline of DBP was observed starting at an age of 63 (p for trend <0.01). 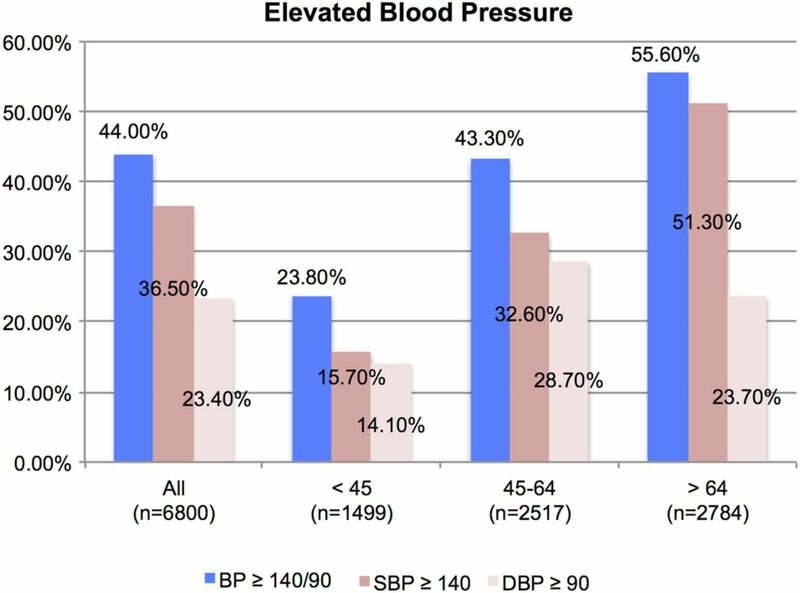 The proportion of participants with elevated BP values at a threshold of ≥140/90 mm Hg. BP, blood pressure; DBP, diastolic blood pressure; SBP, systolic blood pressure. 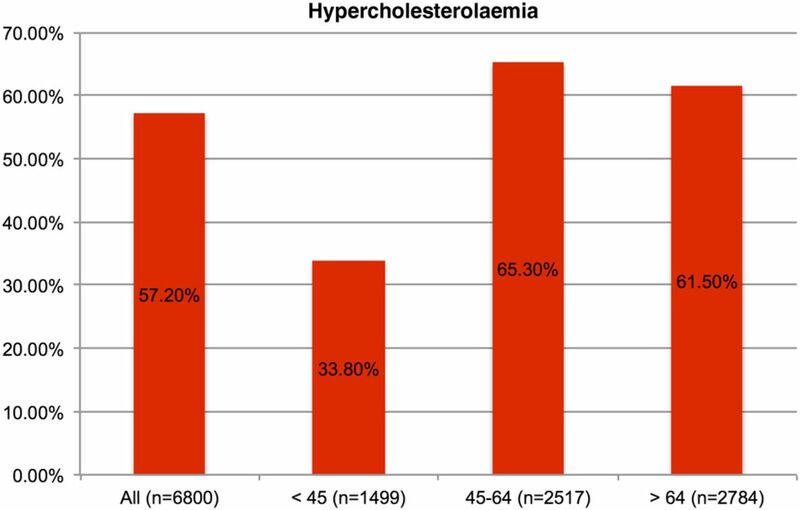 The crude prevalence of hypercholesterolaemia was 57%. Seventeen per cent of predominantly non-obese participants below the age of 25 had total cholesterol levels above 200 mg/dL (5.2 mmol/L). The peak prevalence of 65% was seen in the age group between 45 and 64 years (mean total cholesterol 217±42 mg/dL), declining thereafter (figure 3). Data on cholesterol-lowering treatment in the respective subgroups were not available. The prevalence of hypercholesterolaemia at a threshold of 200 mg/dL (5.2 mmol/L). Ten per cent of minors reported to be active smokers; however, the sample size was non-representative (n=70) in this age group. The prevalence of tobacco use was stable at a high level (35%) in participants between 18 and 44 years of age, and men were somewhat more likely to report smoking compared with women (tables 2 and 3, 39% vs 33%, p=0.03). This trend continued in participants ≥45 years at a lower overall prevalence (15% vs 13%, p=0.02). The survey question regarding newly identified CVRFs related to the instrument-based parameters BP, glucose and cholesterol levels, but excluded smoking and obesity, since the latter did not require a specific screening test performed by a healthcare professional for diagnosis. At least one of these four major CVRFs (IFG, DM, elevated BP or hypercholesterolaemia) was present in 75% of individuals, similarly frequent in men and women (p=0.54, table 2). Excluding IFG, a CVRF was present in 73.1% of participants. Therefore, a new CVRF previously unknown to the participants was identified in 30% of cases and 45% of the cohort subsequently received a recommendation to actively consult their physician (figure 4, tables 2 and 3). The proportion of patients confronted with a cardiovascular risk factor (CVRF) they were previously unaware of, referring to the instrument based tests (impaired fasting glucose, diabetes, elevated blood pressure and hypercholesterolaemia). When only considering the three CVRF likely requiring pharmacological treatment, hence, excluding IFG, a new diagnosis was established in 28%. 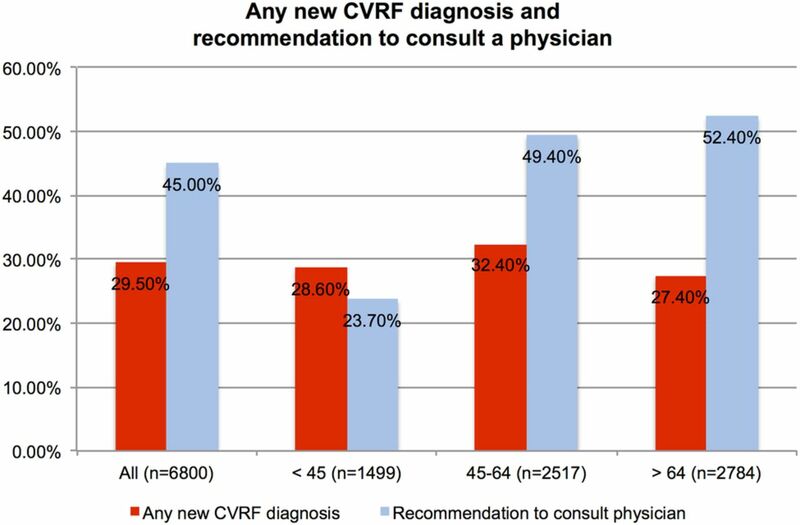 A first-time diagnosis of a CVRF was numerically most likely in the age groups between 25 and 64 (32% of participants), but still frequent above 64 years (27% of participants). The main finding of our study is that, first, this pharmacy-based approach was able to include a broad population sample in order to identify individuals with previously undiagnosed CVRFs. Overall 30% of participants were confronted with a CVRF they were previously unaware of, which frequently prompted the pharmacists to recommend an active consultation of a physician. In particular, participants aged between 25 and 64 years gained the greatest benefit in terms of a newly diagnosed CVRF. The prevalence of hypercholesterolaemia was comparable to European data obtained by the WHO.20 Although recent European guidelines recommend using low-density lipoprotein cholesterol as target for treatment, total cholesterol is recommended for the estimation of CV risk (class I, level of evidence C).10 Accordingly, in the setting of pharmacies, the possibility to conveniently obtain total cholesterol levels using a point of care device seems a feasible approach for CV risk screening and referral for further evaluation, if indicated. Although our study is currently the largest and most recent survey directly assessing CVRFs through instrument-based tests, a selection bias due to refusal of consent cannot be excluded. Since screening is usually opportunistic, we did not aim to include a randomly chosen population sample. This might affect the observed crude prevalences of CVRFs. This pharmacy-based approach for CV risk screening was able to include 6800 individuals within a 4 months survey period. We found similar overall prevalences of CVRFs as reported by nationwide registries, whereas underdiagnosis was substantial, particularly in the lower age groups. One of the three participants was confronted with a CVRF they were previously unaware of and subsequently, 45% of the cohort received a recommendation to actively consult a physician. An active screening approach at pharmacies might therefore serve as an alternative to the public preventive medical examination, particularly in younger age groups favouring the convenience and accessibility of such a pharmacy-based programme. The authors would like to acknowledge Jan Pazourek from the Health Insurance Fund of Lower Austria, and all participating pharmacists of Lower Austria, who willingly agreed to support their research. This work was also supported by the Association for the Promotion of Research in Atherosclerosis, Thrombosis and Vascular Biology and by the Ludwig Boltzmann Foundation for Cardiovascular Research. United Nations Statistical Office. Provisional Guidelines on Standard International Age Classifications, Series M, No. 74 1982.
. The 1975 Declaration of Helsinki and consent. Can Med Assoc J 1976;115:1191–2.
. Social determinants of health and well-being among young people. Health Behaviour in School-aged Children (HBSC) study: international report from the 2009/2010 survey, 2012. Copenhagen, WHO Regional Office for Europe, 2012 (Health Policy for Children and Adolescents, No. 6). Contributors MR was responsible for data acquisition, statistical analysis and the primary manuscript draft. HH, HS and HK are grant holders, drafted the study protocol and recruited study centres. MT assisted with database handling, and the manuscript draft. MF, KH and TWW provided expertise for statistical analysis, interpretation of data and revised the final manuscript draft. All the authors contributed to and approved the final version of the manuscript. Funding The study was funded by the Pharmacists College of Lower Austria (Apothekerkammer Niederösterreich) and the Health Insurance Fund of Lower Austria (Niederösterreichische Gebietskrankenkasse, NÖGKK). Ethics approval Ethics Committee of Lower Austria, Austria.